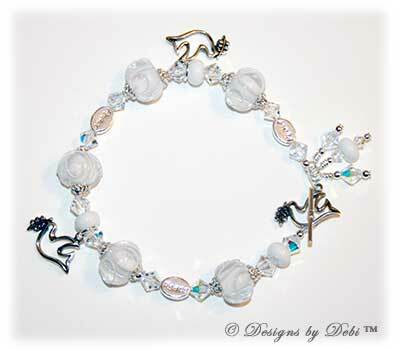 I began this bracelet with gorgeous, custom-made artisan lampwork beads handmade by Cristy Howard of AlyDan Beads. They are clear with a white base and a delicate white scroll design. 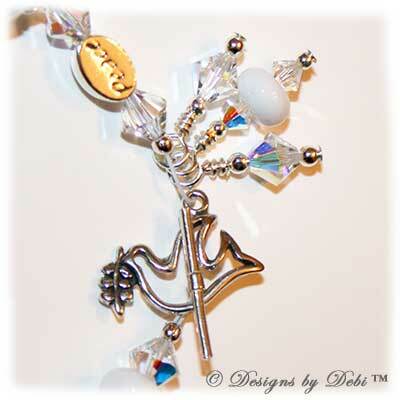 The small white spacer beads were also made by Cristy. I accented her beads with Swarovski® crystal AB (aurora borealis) bicones adding a beautiful twinkling shimmer...glimmers of hope for a peaceful world. 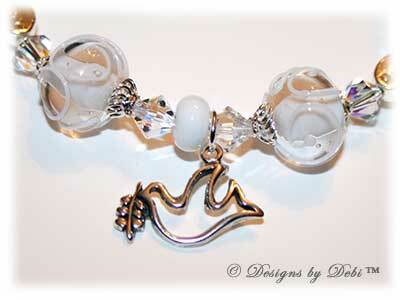 The glass beads are capped with bright sterling silver swirled filigree bead caps. 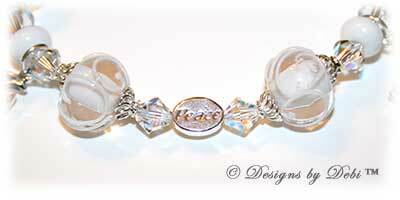 There are 3 mini sterling silver 'Peace' message beads, 2 sterling silver dove charms and the bracelet finishes with a matching sterling silver dove toggle clasp and 3 small coordinating dangles made with crystals, white beads and sterling silver dangling nearby. Try as I might, I just could not capture the true beauty of this piece in photos. December 21st is World Peace Day and Tolerance Week is also in December. 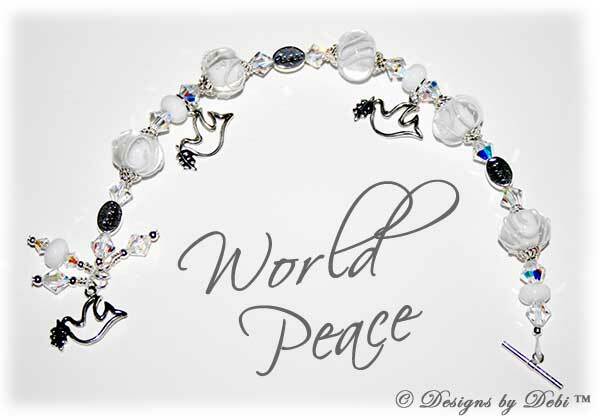 The Awareness Ribbon for World Peace is white...the reason for the white color scheme of the bracelet. And if this is a cause that's meaningful to you, I can add the Awareness Ribbon charm to the bracelet at no charge. The charity I've chosen to receive the donation from this month's piece is Teaching Tolerance. I believe that tolerance is the key to world peace. People need to learn to be tolerant of the differences in others. We need to start teaching and learning tolerance and our children are the perfect place to start...then maybe they could teach us a thing or two. Teaching Tolerance was founded in 1991 by the Southern Poverty Law Center. They are dedicated to reducing prejudice, improving intergroup relations and supporting equitable school experiences for our nation's children. They provide free educational materials to teachers and other school practitioners in the U.S. and abroad. These materials include a self-titled magazine, professional development tools, teaching kits and classroom activities all proven to help students learn respect for differences and bolster teacher practice. They say that although "Tolerance" is an imperfect term, it's the closest the English language offers to embrace the broad range of skills we need to live together peacefully. "Tolerance is respect, acceptance and appreciation of the rich diversity of our world's cultures, our forms of expression and ways of being human. Tolerance is harmony in difference." To find out more about Teaching Tolerance or to make a donation on your own, go to www.Tolerance.org. The bracelet measures 8 1/4 inches and will fit a 6 1/4 inch (loosely, but secure) to 7 inch wrist. If you need the bracelet re-sized, please let me know at time of purchase and this can be done prior to shipment at no additional charge.